In the space & time between the July 4th parade & car traffic returning to Main Street, you can catch a glimpse of what CicLAvia might look like in Santa Monica. Each year, Santa Monica hosts a Main St. Independence Day parade, with a cutesy small town feel that has made it one of my favorite annual events a few years ago. Various civic groups create small floats, or dress up, with homemade signs, and bikes are a staple for a rolling presence. City council members, past and present, cruise the street in electric vehicles, of which Santa Monica has quite a sizable fleet, candy is thrown, flags are waved, it’s a fun little time. National political issues of the day sometimes make an appearance, with a group of whistle blowing marchers supporting Bradley Manning & Edward Snowden this year. 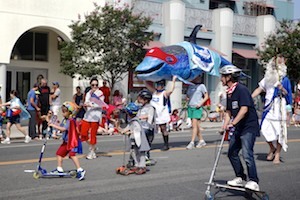 The parade also teases the potential for an open streets event like CicLAvia in Santa Monica, as the parade passes while the open street behind it remains closed to regular vehicle traffic. Back in 2010 (the same year the first CicLAvia was being planned) Richard McKinnon (now on the planning commission), and a few other members of Santa Monica Spoke first proposed trying to bring a Ciclovia type of event to Santa Monica. Piggy backing onto the end of the parade was one of the lower cost options initially being considered as a way to trial the concept. However, just as it was looking like a stand alone event might happen, including some positive press, things sort of dissolved. Even the website for that initial effort is now defunct. Concerns over the way local laws governing street closures for car traffic (which allows for one way parades or marathons, but has no provision for the free form of an open streets event), as well as concerns over logistics, finances and liability, ultimately set back Santa Monica attempting to host its own event. It was probably for the best that the first ciclovia or “open streets” event in the Los Angeles region was CicLAvia. The organizers and the city resources behind CicLAvia enabled going big right out of the gate. A more stunted initial Santa Monica event might not have had the same initial splash and transformative impact that followed that first CicLAvia. However the growing presence of CicLAvia also seems to have had it’s own influence at the July 4th parade this year. I couldn’t help but notice more people than usual flooded into the street space behind the parade to walk, to skate, bike, and play in the middle of the street during the fleeting time before reopening to cars. The Venice Blvd. CicLAvia route, which in earlier incarnations was considering a terminus in Santa Monica, came so tantalizing close. Between that and the glimpses of the potential in the wind down of the parade, it’s gotten me thinking a lot again about bringing an open streets event to Santa Monica. Perhaps under the banner or CicLAvia or perhaps something else. In any case the atmosphere of care free and car free flows of people moving through the city should be given a chance to shine in more Santa Monica contexts than the beach paths and promenade. One idea I’ve heard come up before, even from political candidates at the more conservative end of the Santa Monica spectrum, including former council Candidate Susan Hartley, is having a street like Broadway or Arizona Ave. made free of car traffic on some weekends to become a stress free east/west connection across the city to the Downtown and coastal access. The logistics and politics of this might be a little tricky past Lincoln Blvd. where traffic congestion is currently a more apparent and consistent frustration. But that I heard this idea come from voices I wouldn’t have expected, is an indication to me it’s more doable than many might assume. The presence of bicycling in Santa Monica seems to scale up with our level of accommodation, as can be seen at the enormous bike valet at the Twilight Dance series (which starts up again this Thursday). This ability to so easily scale up cycling for events is an indication to me that there remains a latent demand for active urban transportation, and temporary car-free corridors can be an effective way to demonstrate this potential, and the underlying support for safe ways to get around without a car. Great… just what we need in Santa Monica… closing the streets and causing traffic for no reason at all. Do you not know about the many Farmers Markets we have here that close the streets every week? What is the point?